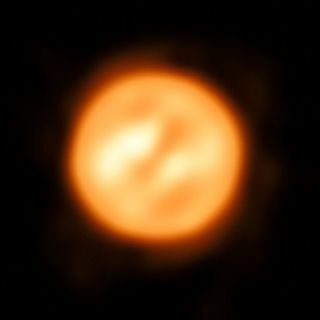 Astronomers constructed this image of the red supergiant star Antares using the European Southern Observatory’s (ESO) Very Large Telescope Interferometer (VLTI). This is the most detailed image ever captured of this object, or any other star apart from the sun. A new photo of the red "supergiant"Antares is the best ever captured of a star other than the sun, researchers said. The image shows Antares' tumultuous surface and reveals unexpected turbulence in its atmosphere, hinting at some mysterious process that is churning away violently inside the stellar mass, the scientists added. Now, using the European Southern Observatory's Very Large Telescope Interferometer (VLTI) in Chile, astronomers have resolved the turbulent structure in the star’s outermost layers, revealing, for the first time, detail on a distant star’s surface and, possibly, filling in the gaps of our knowledge as to how massive stars die. "How stars like Antares lose mass so quickly in the final phase of their evolution has been a problem for over half a century," Keiichi Ohnaka, of the Universidad Católica del Norte in Chile, said in a statement. "The VLTI is the only facility that can directly measure the gas motions in the extended atmosphere of Antares — a crucial step towards clarifying this problem," added Ohnaka, detailing the new finds that waslast week "The next challenge is to identify what’s driving the turbulent motions." This artist’s impression shows the red supergiant Antares, a dying star 12 times more massive than the sun that lies in the constellation of Scorpius. The VLTI consists of up to four telescopes — a combination of 26.9-foot (8.2 meters) "Unit Telescopes" and smaller 5.9-foot (1.8 m) "Auxiliary Telescopes" — that combine their collected infrared light via interferometry to create a "virtual" telescope 660 feet (200 m) wide. Very high angular resolution of distant objects can therefore be attained, allowing the dramatic, bubbling surface of Antares to be studied in detail. Using an instrument called AMBER (Astronomical Multi-BEam combineR), Ohnaka’s team was able to measure the speed of plasma bubbling up from Antares' interior at different positions and compare these speeds with the average speed of plasma across the whole of the star. From these data, a map of the relative speed of atmospheric gases over the star’s disk could be created. This is the first time that such a map has been created for any star apart from the sun, study team members said. Astronomers constructed this map of the motions of material on the surface of the red supergiant star Antares using data gathered by the VLTI. This is the first such velocity map of any star other than the sun. In red regions, material is moving away from us; in the blue areas, material is approaching. The empty region around the star is not a real feature but rather shows where velocity measurements were not possible. Immediately, the researchers uncovered a surprise: There appears to be turbulent, low-density gas erupting much farther out from the star than theoretical models predict. Usually, in stars like our sun, convection flows of superheated gases bubble up from near the stars’ cores to the surface, much like the convection flow of water in a boiling kettle. But convection cannot explain Antares’ strange atmosphere, and the researchers conclude that, for the atmospheres of red supergiants, there must be another — as yet unknown — process that drives the motion of material. Ohnaka is hopeful that the observational techniques demonstrated on Antares may be applied to other stars to see how their atmospheres are structured, perhaps revealing the mystery that drives these turbulent motions. "Our work brings stellar astrophysics to a new dimension and opens an entirely new window to observe stars," he said.